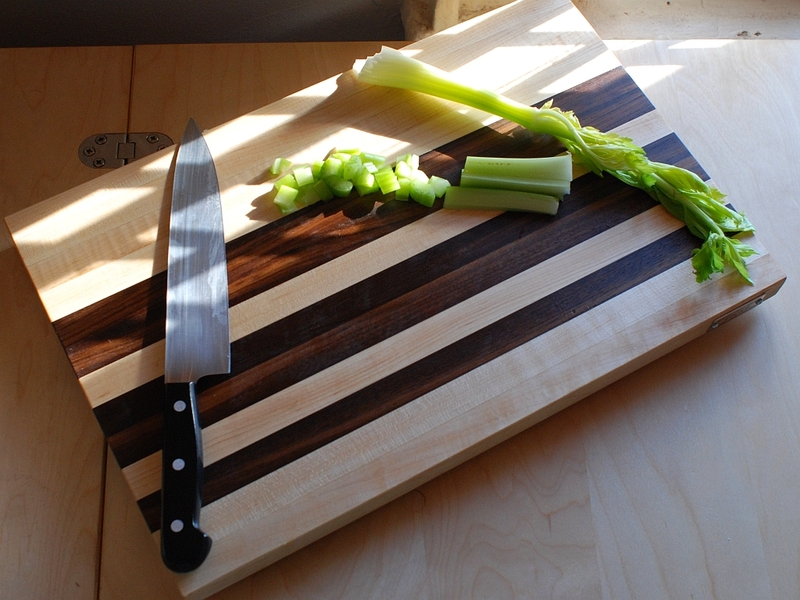 It's a great all purpose long-grain cutting board. Walnut and hard maple cutting board. 13" x 16", 1.25" thick. The stripes, read vertically, add a Morse code monogram to the board. With this example on the left, the two wide stripes at the top are dashes, the narrow stripe at the bottom is a dot, which is how you would represent a "G" in Morse code - dash dash dot. Now imagine it made of wood, with four rubber feet, slick handholds, and wall mountability, and you have a cutting board that works well in your kitchen. Or as a gift in someone else's. Here’s the complete list of features and options. Send me an email to buy and for more information.